Free Shipping Included! 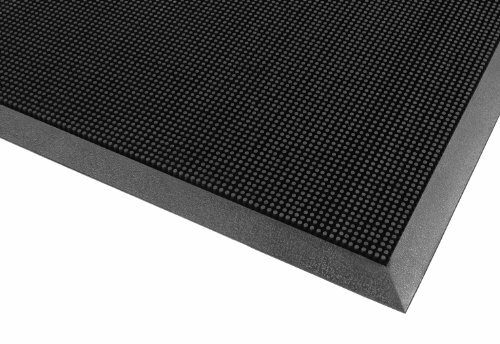 Notrax 345 Rubber Brush Styrene-Butadiene Rubber Entrance Mat, For Construction Traffic Area and Municipal Buildings, 24'' Width x 32'' Length x 5/8'' Thickness, Black by NoTrax Floor Matting at tradingmart.net. MPN: 345S2432BL. Hurry! Limited time offer. Offer valid only while supplies last. Best 345 rubber brush entrance mat. Rubber Brush mats are constructed of tough SBR rubber to remain flexible while withstanding extreme cold. Best 345 rubber brush entrance mat. Rubber Brush mats are constructed of tough SBR rubber to remain flexible while withstanding extreme cold. Thousands of tough, flexible rubber fingers sweep shoes clean while suction cups on the underside of the mat help to minimize shifting. Due to its durable construction, Rubber Brush is the perfect year round outdoor entrance mat for schools, municipal buildings, plant entrances, and office buildings. Test - Test Description - Results: (1) Abrasion Resistance ASTM D3884-01 - Test specimen is subjected to the rubbing action of two abrading wheels under controlled conditions. Results measured in Weight loss (Grams) - 3.12. (2) Accelerated Wear - Test specimen is subjected to the action of rollers under a specified load. Sample is rotated 10 degree after each pass. Results measured in thickness loss (percent) - 0.77 percent. (3) Accelerated Soiling ASTM D6540-00 - Test specimen is subjected to an accelerated soiling process. for a predetermined length of time. The sample is vacuumed, rated, submitted to an extraction device, then rated again. - N/A. (4) Water Retention - Test specimen is submerged in water for 5 minutes, removed, drained for 15 seconds and weighed. Results measured in weight gain. (Gallons per square yard) - 0.03. (5) Flammability ASTM D2859 (CPSC FF 1-70) - Intended to measure the mattings response to an ignition source in a controlled environment. The uncharred area of the test specimen must be greater than 1 inch to pass. - 3.6. All testing of NoTrax floor matting has been performed by an independent testing laboratory. Available in black color. Use for outdoor entrances of schools, municipal buildings, plant entrances, construction traffic area. Molded beveled edging on all 4 sides creates a retention dam to trap moisture.